Microsoft doesn't view Kinect simply as just some peripheral. It's as important as a console. That's why the company poured millions into launching Kinect. And as expected, Xbox 360 sales saw a spike in Japan. Xbox 360 sales actually tripled. But that wasn't big enough for the console to overtake the DSi. Or the DSi XL. Or the Wii. Or the PS3. Or the PSP. For the week dating from November 11 to November 21, the Xbox 360 sold 7,083 units in Japan. The previous week, Microsoft only sold 2,149 units. So, even with all those Kinect ads on televisions and Xbox Japan's marketing push, the company was only able to 7,000 consoles sold. It is worth noting that Kinect went on sale on November 20, so this week should also see a bump in Xbox 360 sales. However, with Gran Turismo 5 going on sale in The Land of the Rising Sun, expect a PS3 bump, too. However, none of the games released for Kinect broke the software top 20 chart. The 20th game on the Japanese software sales chart is Winning Eleven 2011 (Pro Evo Soccer) for the Wii, which sold 8,105. That means that the biggest selling Kinect title sold less than that. Sales of Kinect as a stand alone are definitely likely to be higher than Xbox 360 software and console sales. Some Japanese sites are reporting that Kinect sold 16,911 stand alone units in its first week with retailers saying its moving more than initially thought. Couple that with Xbox 360 Kinect bundles, and there is the beginnings of a Japanese installment base — though, certainly nothing like Kinect sales in the U.S. or Europe. But it's decent enough for Japan. In the U.S., Microsoft sold over a million Kinect units in its first ten days on sale. Over 150 gamers lined up for Kinect's Akihabara, but reports of the peripheral drawing long lines elsewhere were scarce. To promote the game, Microsoft used members of popular schoolgirl idol group SKE48. Does that mean these girls weren't able to parlay their idol status into Kinect or Xbox 360 sales? Well, Microsoft did end up tripling console sales. Then again, Microsoft typically occupies the basement of the Japanese sales charts, along with the PSPgo and the PS2. 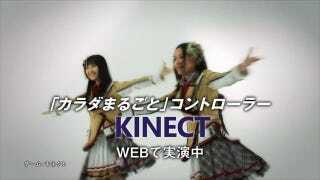 Japan might seem lukewarm towards Kinect and the Xbox 360, but it's still very much keen on SKE48. The group's newest single, "1!2!3!4! Yoroshiku! ", was used as the theme song in the Japanese Kinect ads. The single was released on November 17 and (at the time of posting) is number two on the Japanese charts, selling nearly 120,000 copies. The group held handshaking events to promote the tune, and over 3,000 fans appeared at one meet-and-greet event in Yokohama with all SKE48 members! Of course, CD singles are way cheaper than game hardware — but Sony and Nintendo just sold a bunch of handheld and home game consoles without a nationwide commercial campaign that employed two popular idols. So is an event at which two SKE48 members appeared that drew 150 people a success or failure? Microsoft increased Xbox 360 sales and launched Kinect in Japan, but at what cost and for how long?